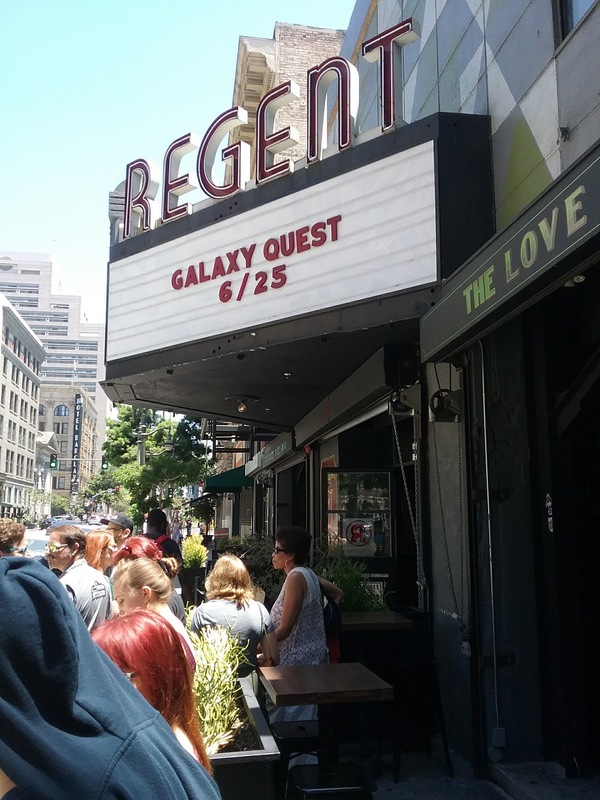 Having made the trip to downtown L.A. last night for a fantastic screening of “Jaws”, we returned to the area today for another screening that was equally marvelous, “Galaxy Quest” at the Regent Theater. 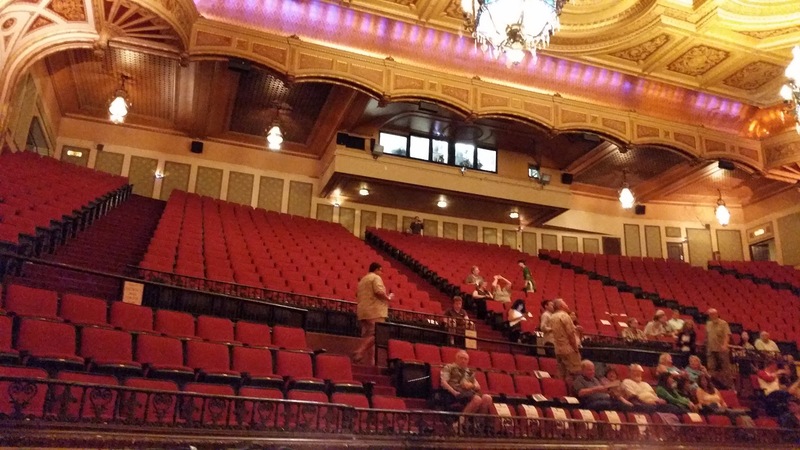 This is a much smaller venue, and it lacks the historical value of the movie palace we visited last night. The venue is more of a club now a days but they do show films occasionally so they have a big stack of folding chairs that they can dig out and put in rows with zip ties. I can’t really complain because the folks there treated us well and made sure that we got an accessible seating spot, so the staff is great. The one time I have written about this movie before was in a post I titled “Three Perfect Movies“. It is the second film on that list and as I said at the time, there is nothing that I think could be changed about it to improve it at all. The screening today was sponsored in part by “Screen Junkies“, a website I am sure most of the readers of this blog have visited. 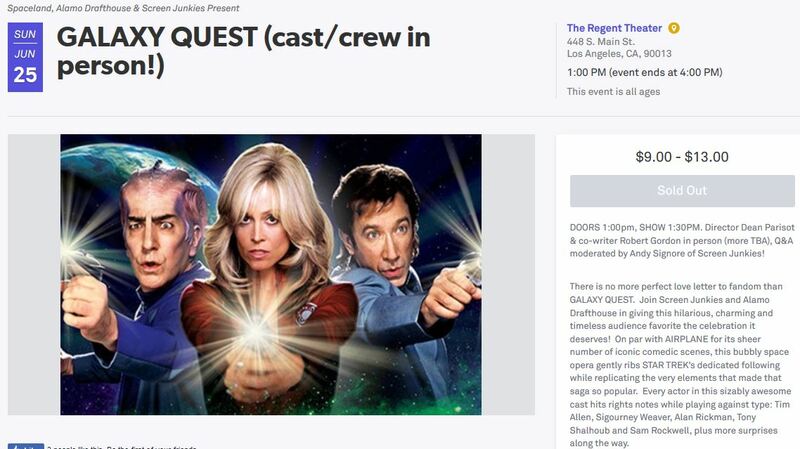 They are putting together a documentary about the legacy of “Galaxy Quest” and there were cameras in line and during the Q and A, to insure there will be contemporary original material to go with their interviews. They are working in conjunction with Alamo Drafthouse, who will be opening a theater complex in Downtown L.A. next year, and they provided a rough version of a trailer for the film at the start of today’s presentation. Hopefully that preview will be available soon so that everyone can anticipate the film. The screening today included several guests, but there was also cosplay going on in the line and in the theater. 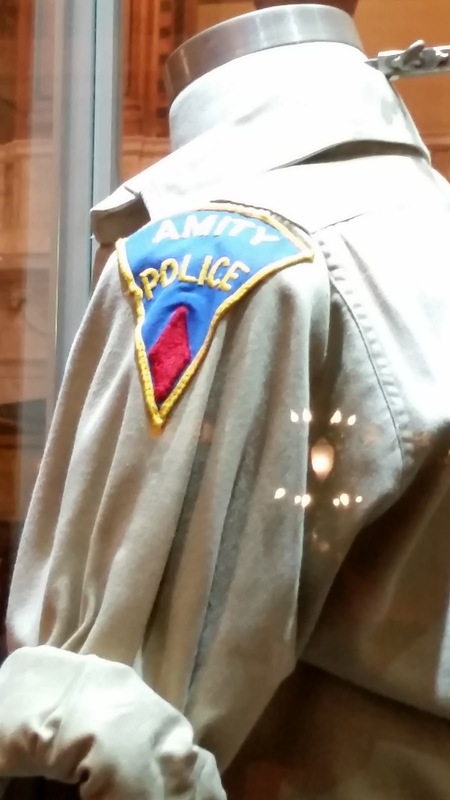 A young woman right behind us in line had her own Lt. Tawney Madison uniform and she was interviewed by the film crew. Later, a band of Thermians showed up in character and charmed everyone and willingly posed for pictures. 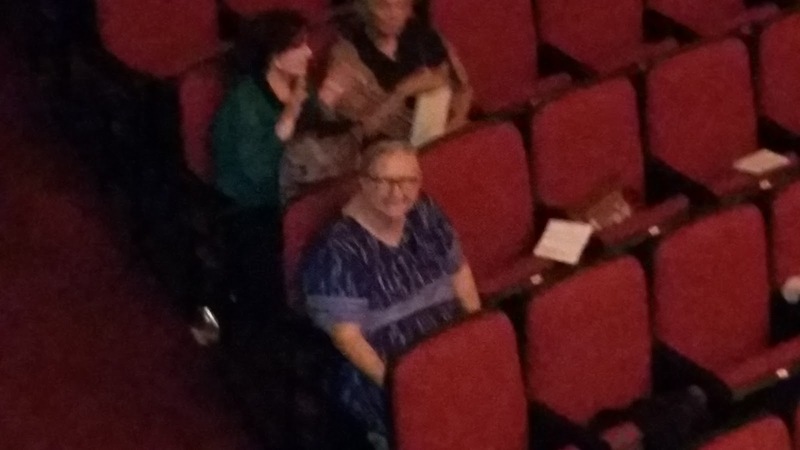 That group ended up in the front row and will certainly be a part of the documentary feature as well. The film, for anyone who has missed it, is a humorous tribute to the cheesiness of the Original Star Trek series and their fans, who would form the basis of the current geek culture. The movie does not treat the characters disrespectfully and it clearly has a warm spot in it’s heart for the actors that are being thinly lampooned. The screening today looked to be a DCP presentation, and it lacked to switch from one aspect ratio to another that I so distinctly remembered from my original viewing of the film way back in 1999. The sound was great for the audience, but the setting were such that the cast and crew who spoke after the film, had a hard time hearing each other in spite of using microphones. It is the guest list that makes the presentation today so special. Mark Johnson, the Academy Award winning producer of “Rain Man”, was also the producer for this film and his appearance here suggests how deeply he really cared about the project. Also speaking of a film he seems to truly love was director Dean Parisot. Screenwriter Robert Gordon was included in the proceedings as well and his contributions to the discussion and to the screenplay were great. Two of the actors who starred in the film also were surprise guests, they were Enrico Colantoni who played the Thermian leader Mathesar and Missy Pyle who was the other female star of the film. Johnson told a story about how the film came together and mentioned that he hired Parisot after having worked with him on a previous film, when the original director (Harold Ramis) left the Galaxy Quest project. Parisot was also described as famously handling notes from the studio by nodding his head and then ultimately not doing anything of the sort. The best example of that was the line that Sigourney Weaver was supposed to deliver upon seeing the crushers she and Jason (Allen’s character) are expected to traverse. She said the original “F*@k” and Parisot did not shoot any coverage or alternate takes of that scene so when it is dubbed, it is clear what she originally said. Gordon spent some time revealing an odd note that came from Dreamworks Exec Steven Spielberg, that he’d had a dream about the villain of the film “Sarris” and a large ball. Everyone was a little unsure how to tell the genius that his idea was wack, and Gordon said he thought it might have been a test, to see if the screenwriter really believed in his own work and would stand up for it. Enrico Colantoni shared a little bit about his time with the film, and he appears to have created the dynamics that represent the Thermians behaviors during the movie. Casting Director Debra Zane was in the audience, and the director asked to to explain how she used Colantoni’s audition tape to prompt the other actors for their roles. Missi Pyle told a couple of stories about everyone who played a Thermian attending “Thermian Academy”, basically a camp project where the actors honed their off kilter vocal delivery and practiced the odd walk and arm movements of the aliens. The best piece of information revealed was that the rock monster, when finally ejected into space, was supposed to have a thought line that read “Tranquility at last”, but someone decided we don’t really need to know the motivation of a rock monster. 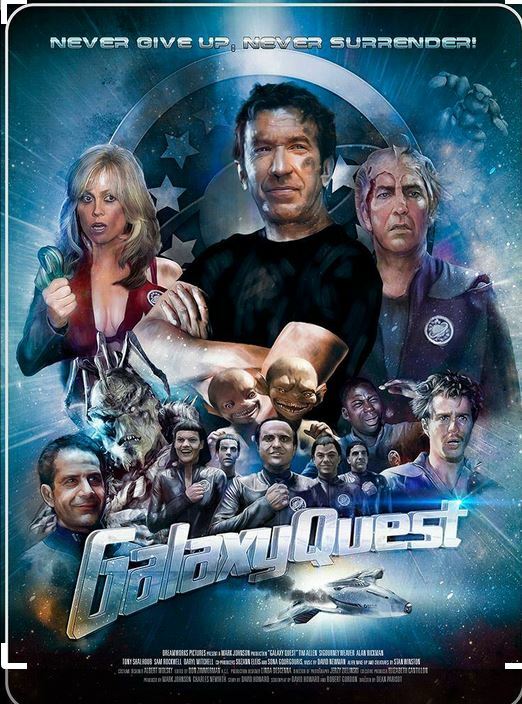 Everyone was heartsick about the loss of Alan Rickman last year, and that seems to have put the “Galaxy Quest” limited TV series on hold for the moment. Both Johnson and Parisot seem to hold out hope that it will still happen, and the crowd was very enthusiastic. We also met up with my friend Michael who writes the site “It Rains…You Get Wet”. We last saw each other at the TCM Film Festival, and today he was joined by his daughter who is about to embark on her senior year. So it was a successful afternoon and a joy to see a great movie with fans who love it as well. 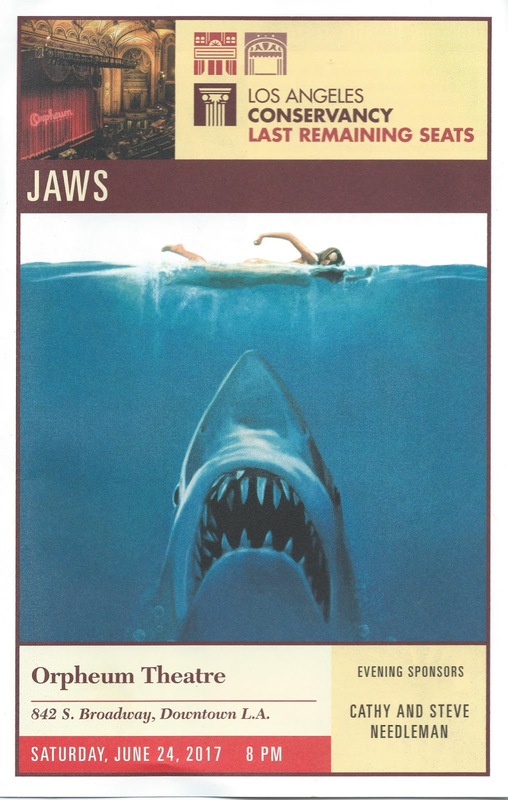 As regular readers know, “Jaws” is an annual event at the KAMAD site. I probably watch the film two or three other times in the year, but when summer shows up, and the Fourth of July is on the horizon, I look for a big screen presentation of this family favorite film. It will be playing at the Egyptian on the holiday weekend, but we are traveling so that was out. Lucky for us, the L.A. 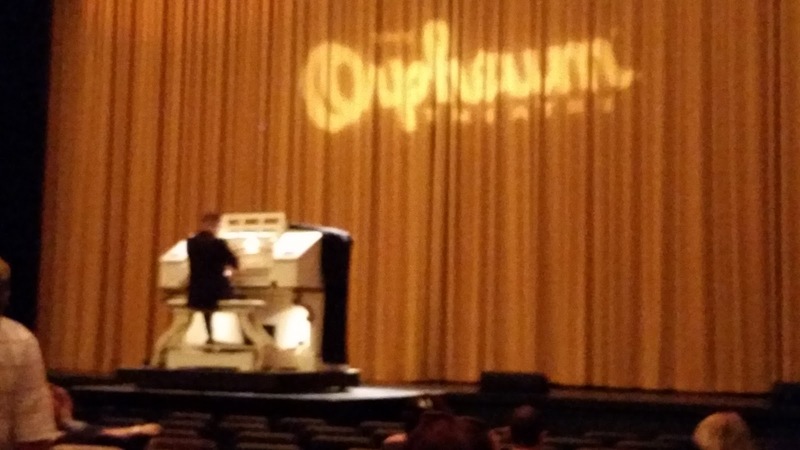 Conservancy is hosting a screening at the historic Orpheum Theater in the “Downtown” area this evening and there are several bonus elements to be had. 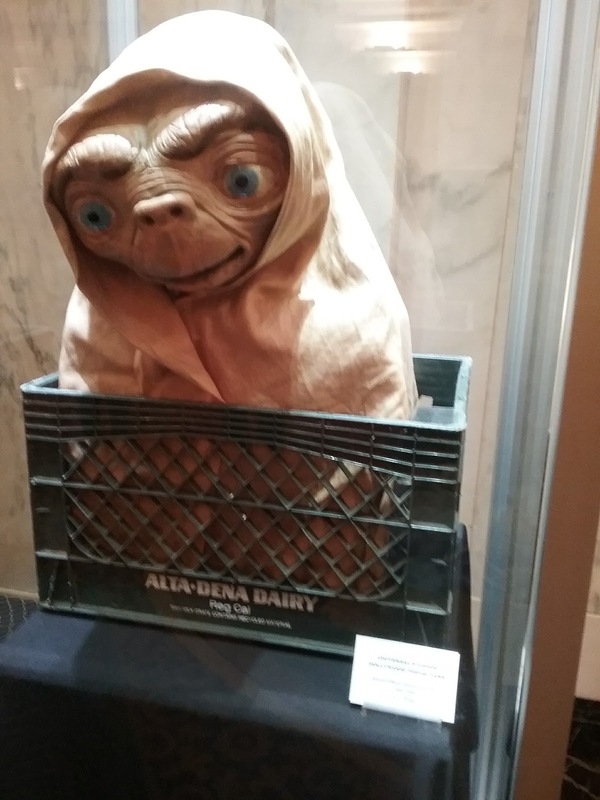 Two years ago, I went all out for the fortieth anniversary of the film, with four big screen visits in a ten day period.You an access those posts, here, and here and here. 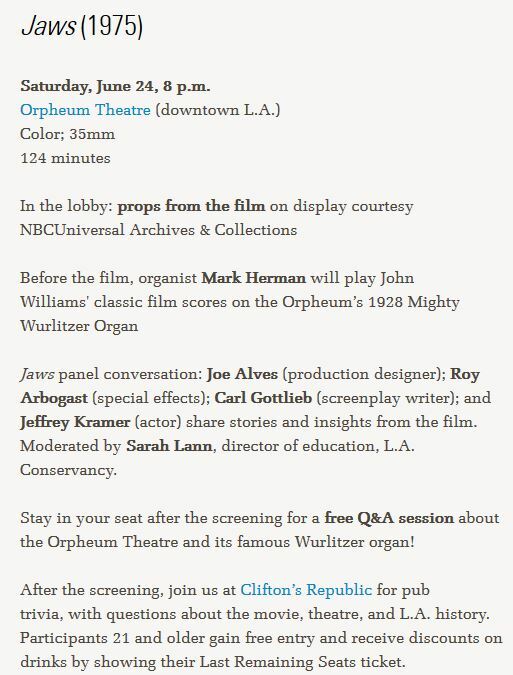 Sadly, there will just be the one screening in a theater this year but it will be packed with goodies, including a rendition of the soundtrack of the film on a Mighty Wurlitzer Organ. 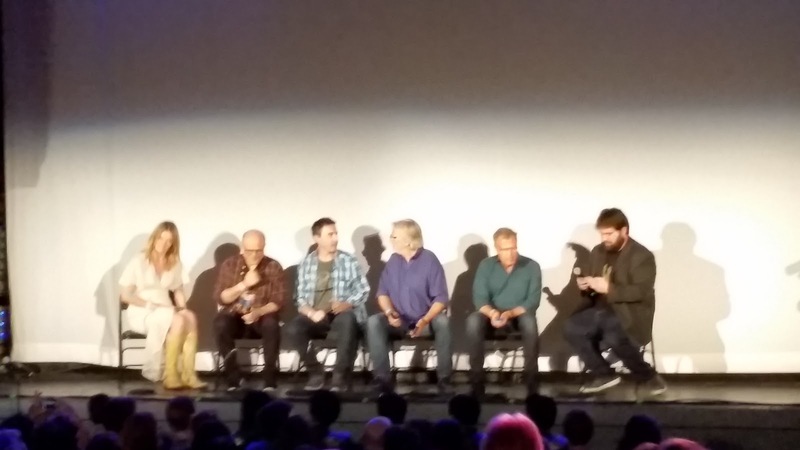 This was pretty much the same panel we saw at the L.A. Film Fest debut of “The Shark is Still Working” back in 2009. They told a couple of the same stories and once again gave credit to Bob Mattey, the creative consultant they remembered from “20,000 Leagues Under the Sea”. 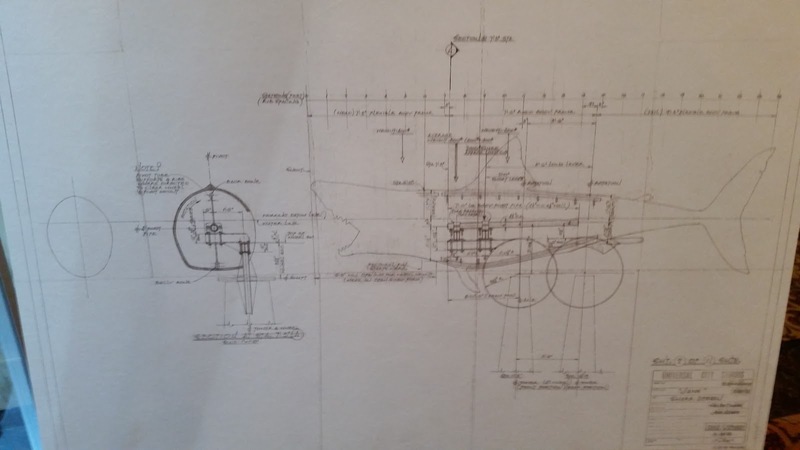 It turns out that the fact they were pushed off the lot by higher priority effects for “The Hindenburg, Airplane 75 and Earthquake” gave them the opportunity to be more creative. Roy Arbogast was able to use new urethane products instead of latex and that made a big difference. Joe Alves was on the project longer than anyone else. 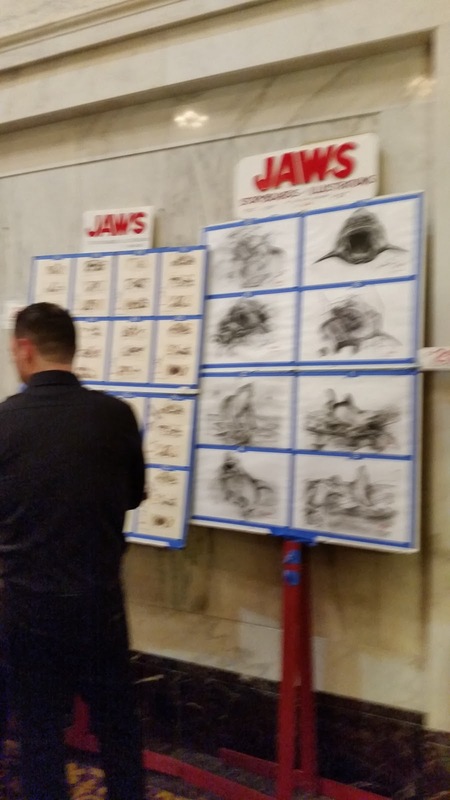 His production drawings had a huge impact on the look of the film, and even though they were not embraced by all the executives at Universal, the right guy found them to be very promising. 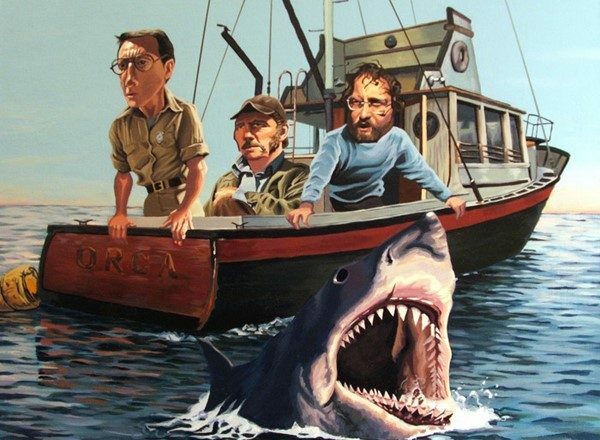 Alves was on the movie before Spielberg was and later directed “Jaws 3D”. Carl Gottlieb showed once again why he was an important part of the crew. As the principle author of the screenplay, he helped build the beats in the story that keep it involving. Last night he did the same thing, contributing a comment or correction at just the right moment and almost always getting a laugh as he does so. He was in the lobby before and after the show, selling and signing copies of his book. I already have “The Jaws Log” signed, and you can read about it there. Jeffery Kramer is the actor who played Deputy Hendricks to Roy Scheider’s Brody. He does get elevated to Chief in Jaws 2. He has been a producer in television for a number of years, but the blogging community will all love the fact that he was also in “Clue”. 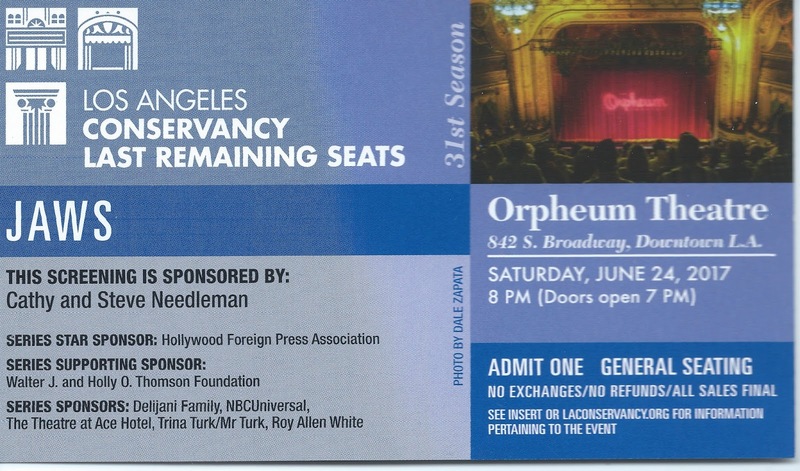 The screening was part of the L.A. 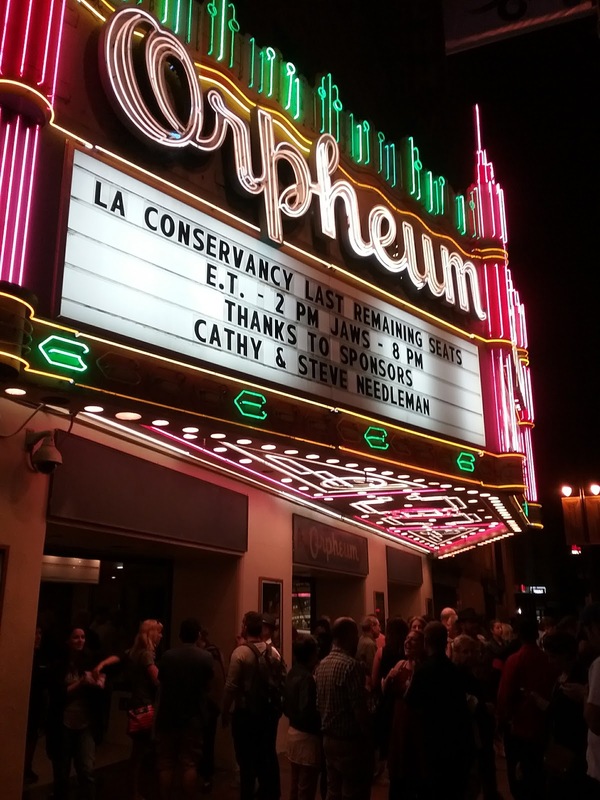 Conservancy program “Last Seats Remaining” , earlier in the day they did a screening of “E.T.” so it was a Spielberg day at the Orpheum. 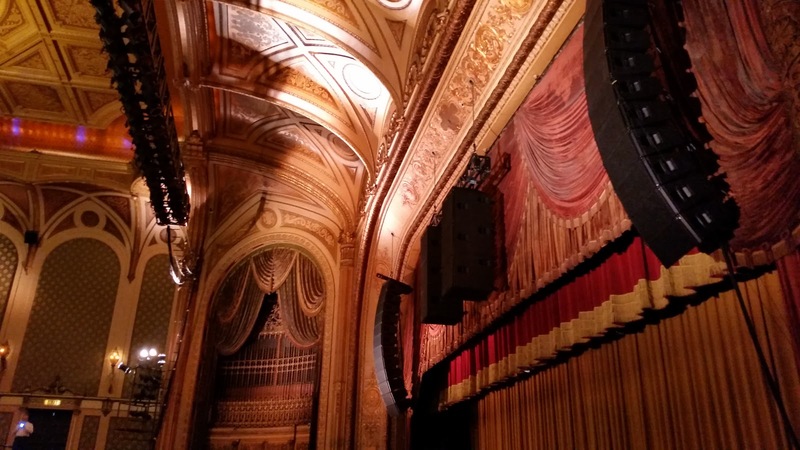 A couple of months ago we went to a live podcast at the old United Artists Theater now known as the Theater at the Ace Hotel. 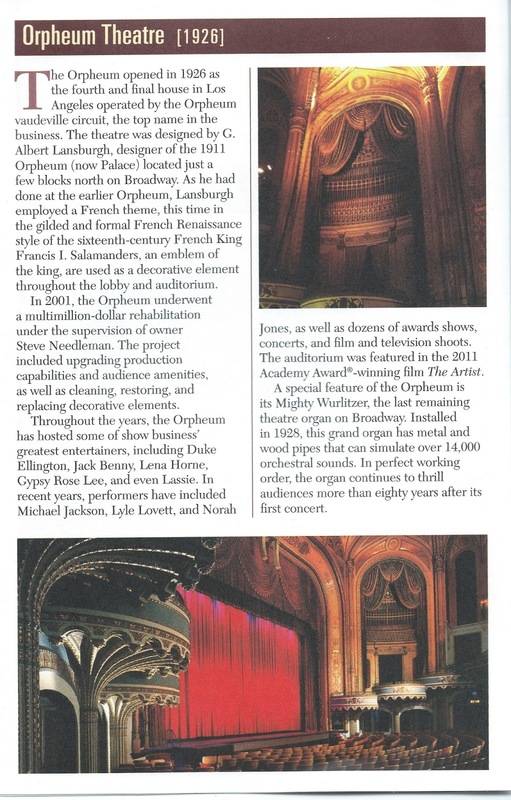 It is just down a block from the Orpheum. 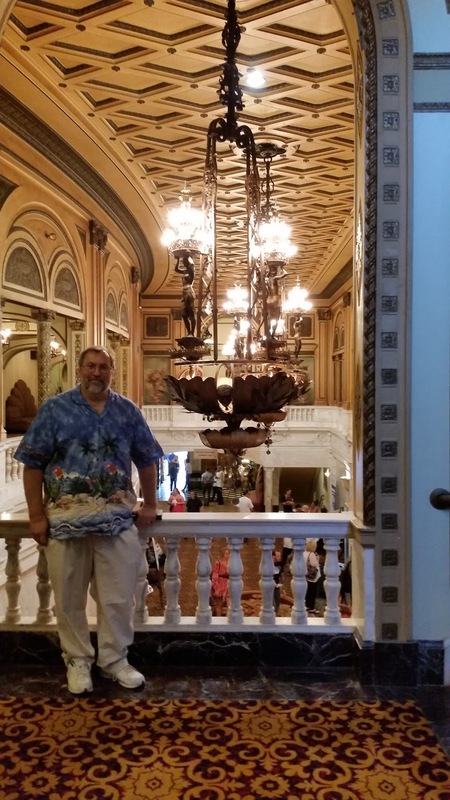 There are eight or nine old movie palaces on Broadway, and a few of them have been restored and are used for special events and historical purposes. There was a beautiful flyer distributed to patrons, which explained a little about the conservancy but also listed the program. One of the biggest pleasures was seeing this film with a huge live audience in a classic movie palace. 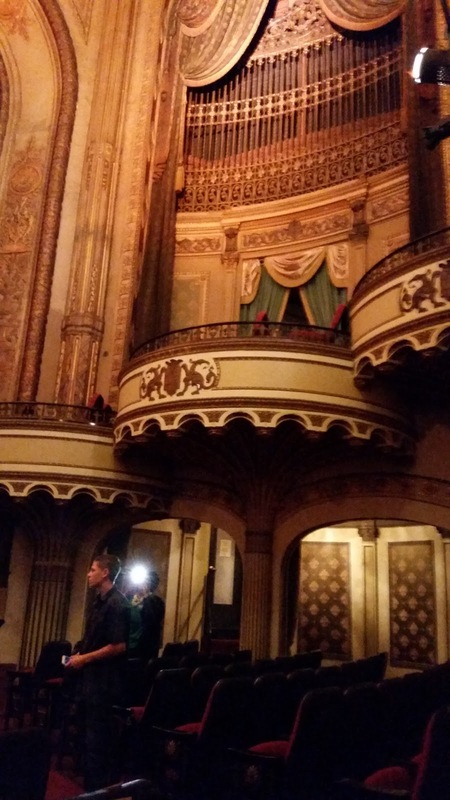 These theaters put to shame the new multiplexes which are long on modern technology but often short on style. The fantastic neon accented marquee out front looks glorious at night, who would not want to go in and see way mysteries will be revealed beyond the door. 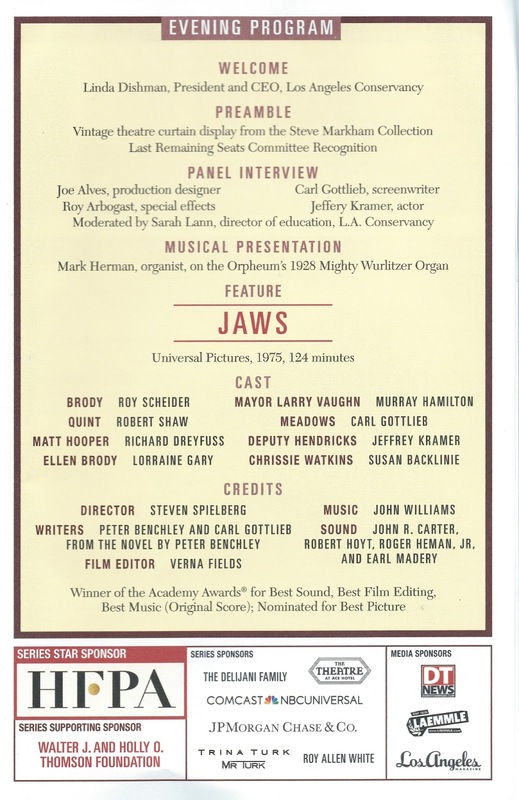 As was mentioned, the organist entertained for an hour before the program started, and while the whole Jaws Score was not presented, there were a number of John Williams pieces that were shared with the enthusiastic audience. Steve Markham, a longtime member of the Conservancy, a WW2 veteran, and a collector, shared some of the beautiful backdrops he has. My Dad actually had two or three backdrops like this that he sold with the Thurston show. I did not take pictures last night but there is a nice video that includes several of the pieces we got a chance to see. 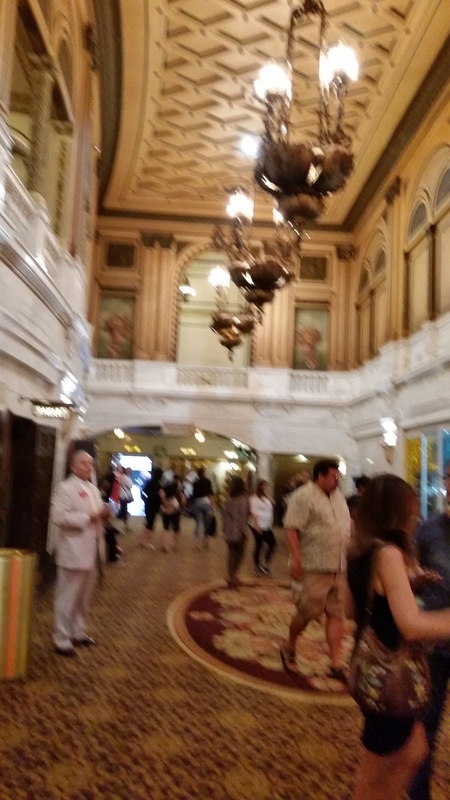 The theater itself has a magnificent lobby and there is a three level mezzanine to view it from. 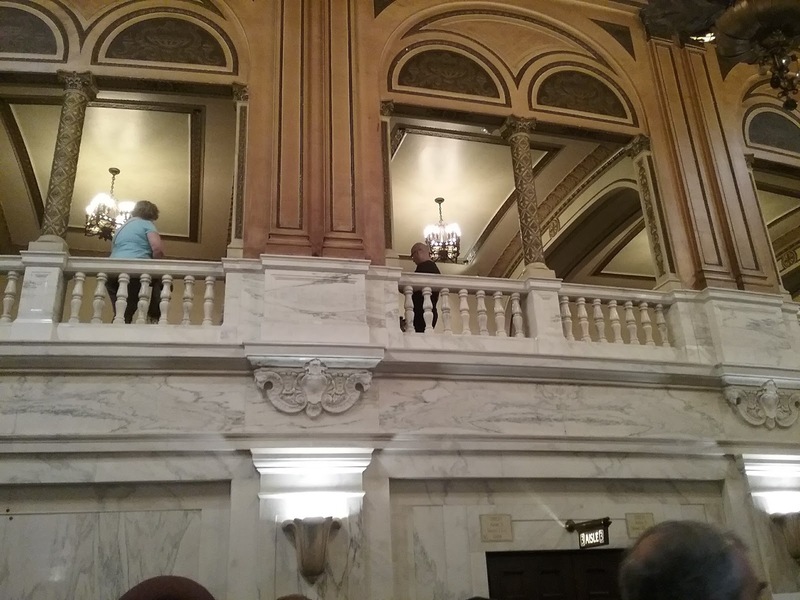 We might have been tempted to watch the film from the balcony or from the Opera Boxes on either sides, but getting up there would have been a little complicated for our group. There were bars on all the levels, including the lower level where generous lavatory facilities are located. 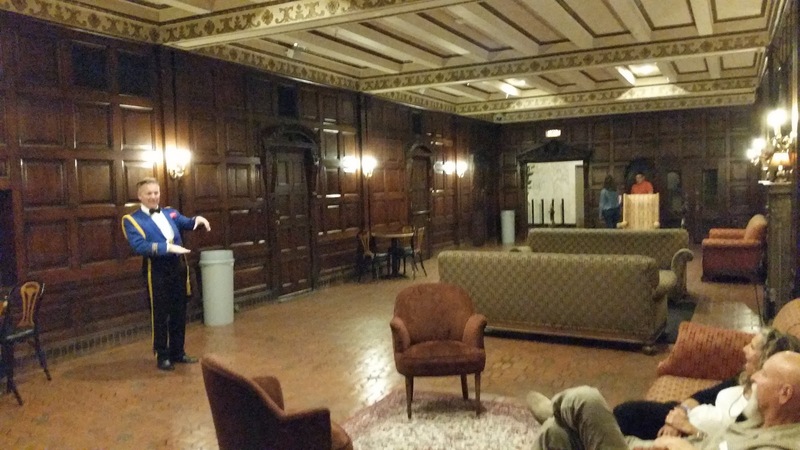 There was also a lounge where one of the traditionally garbed ushers was answering questions for guests before the show had started. This is the kind of luxurious presentation of films that made movie going in the golden age of Hollywood a real special event. You did not simply see a film, you took your time soaking up the atmosphere, lingering over the opportunity to share a night out with other like minded patrons. 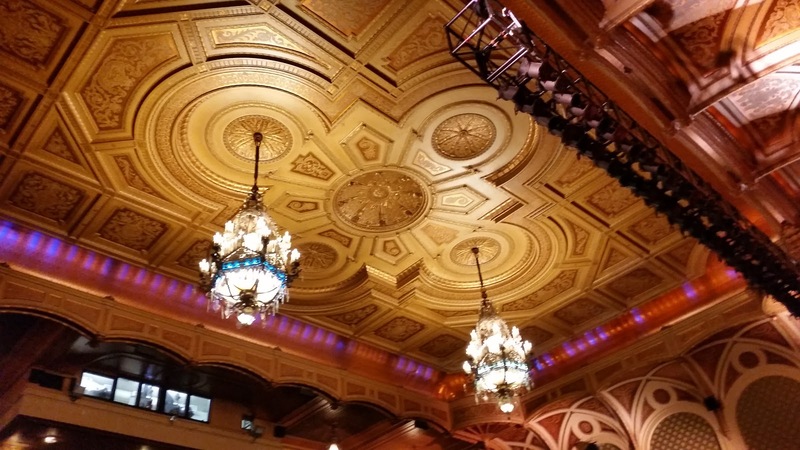 The theaters were also used on the vaudeville circuit so live entertainment would also be on a program on a regular basis. The world has changed, and maybe if we look around a bit more we will appreciate some of the things that have passed a bit more. I’ve said it before, I miss the days when music filled the air before the show and then curtains parted to reveal the screen. I’d be happy to pay extra for these kinds of amenities if I could skip the half hour of commercials that precede most theatrical presentations these days. The props and costumes were not elaborate by any museum standard, but they were a nice bonus to the evening. The movie was a complete hit with the audience. It was great listening to 1500 people scream and laugh together. There was spontaneous applause after a number of scenes and once again, you could hear a pin drop as Quint tells us his story of survival on the U.S.S. Indianapolis. Robert Shaw has to be remembered forever for this five minute sequence. 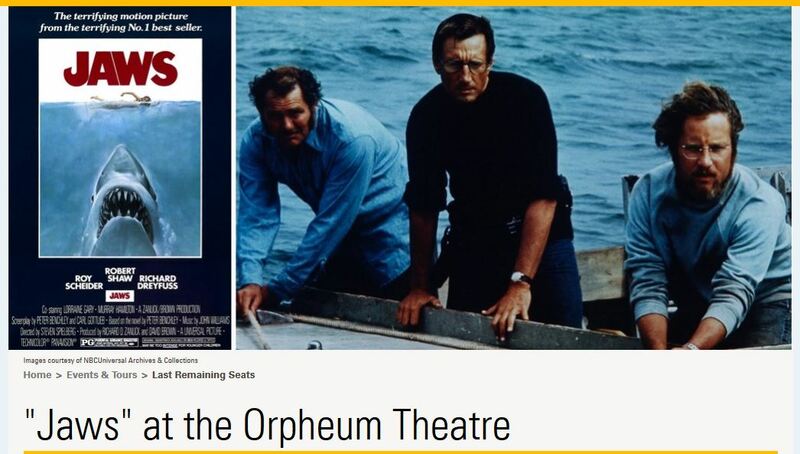 The movie “Jaws” has mesmerized audiences for forty plus years, it is one of the great accomplishments of the cinema. If you think the effects are old fashioned, you need to watch the film with an audience. No one is longing for a CGI shark, we are all holding our breathe as the practical effects and live footage take us into the story. When you add in the surrounding environment to the experience, I can say we got one of the best presentations of the film in a theater ever. I know I have seen this film more than a dozen times on the big screen, and that is just in the last dozen years. This will be one viewing that will never get lost in my memory.